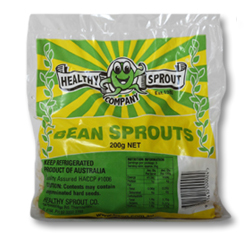 A large sprout, with a nutty flavour and texture, they can be eaten raw or cooked. 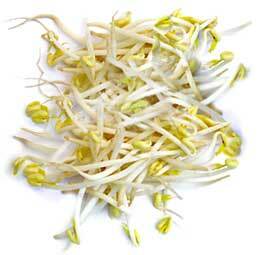 Bean sprouts contain significant levels vitamin A, BI, B2 and C, calcium, iron and niacin. They are high in fibre and are beneficial in countering protein deficiencies because they are fibre high. 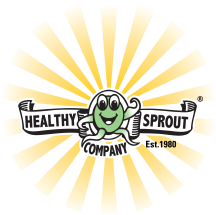 These are the best sprouts for stir-frying, and can also be served raw . In Asia they use ingredients such as garlic, ginger, spring onions, or pieces of salted dried fish to add flavour to a bean sprout stir fry dish. Add the oil to a heated wok or heavy pan . Once the oil is hot , add the sprouts and stir-fry quickly . Add the soy sauce, sugar and salt. Stir-fry for another few seconds and add the sesame oil. Serve immediately as a side dish to Asian dishes. 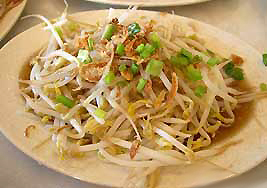 Bean sprouts are also suitable to add to soups and stews as they retain some of their crispness when heated.